A quick video of Meghan as she arrived at the facility on a rainy London afternoon. 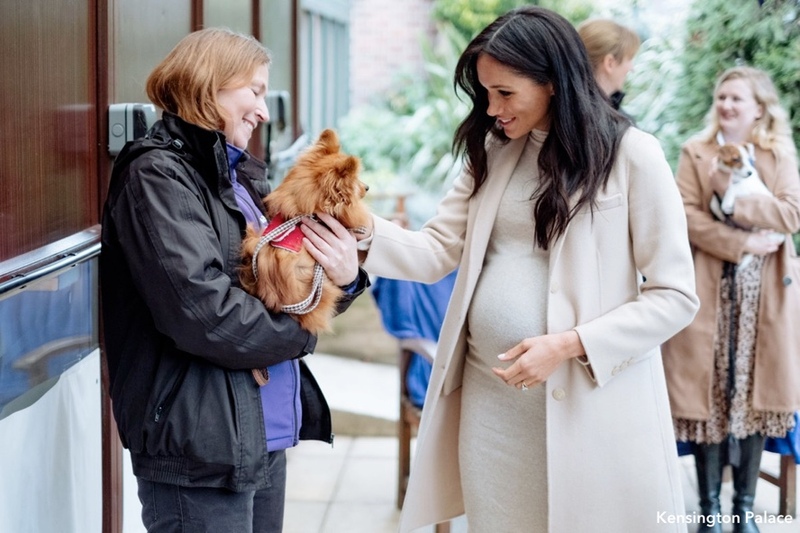 The Duchess was named royal patron last week; it is an outstanding fit, as Meghan has long been an advocate for animal welfare. Today’s engagement offered an opportunity for us all to learn more about the organization. 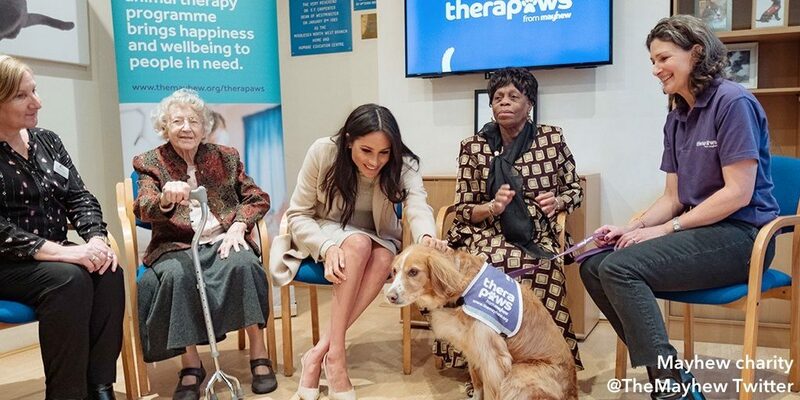 Our team of volunteers take their therapy dogs into care and residential homes, hospitals, hospices and day centres across London to engage with residents, provide companionship and brighten up their day. We specialise in visits to the elderly with dementia and to palliative care units encouraging social interaction to promote emotional and physical wellbeing. One of the nursing home residents Meghan met today had an unexpected comment about her baby bump that prompted a laugh. Meghan, ever quick on her feet, had a witty response. Today’s visit included a tour of the cattery. While there the Duchess met Marion and Ted (seen below), who have used Mayhew’s services. She also heard how the “Trap, Neuter and Return” program for feral cats brought about Marion and Ted’s friendship. Some statistics on Mayhew’s work in 2018 via Kensington Palace. 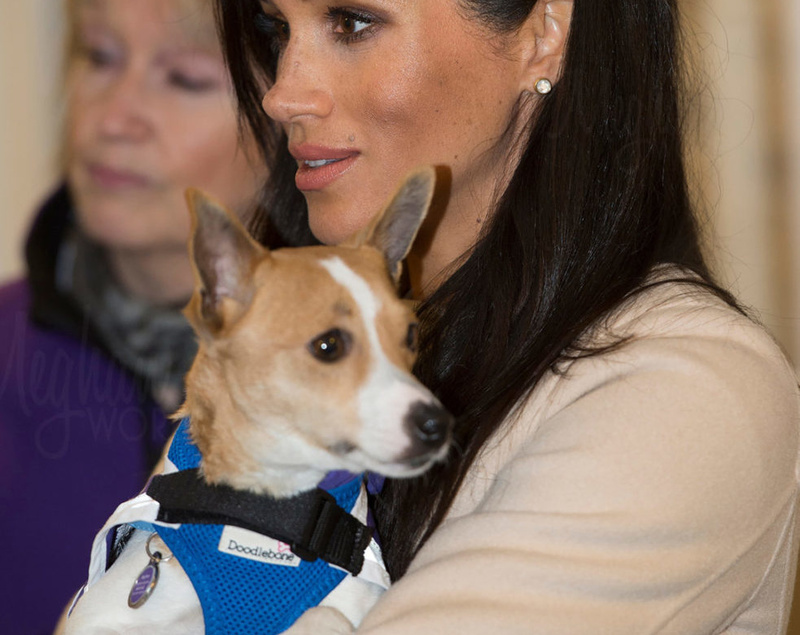 Meghan met Minnie, a Jack Russell terrier. No one was surprised to see her scoop Minnie up in her arms. Minnie didn’t seem to mind being held by the Duchess. Mayhew does work in four countries: Afghanistan, Georgia, Russia and India. 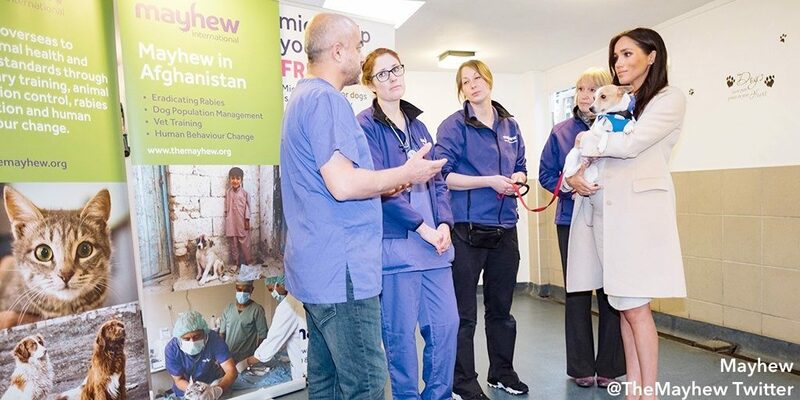 Here you see Meghan being introduced to Dr. Mo, Mayhew’s Afghanistan Country Director. 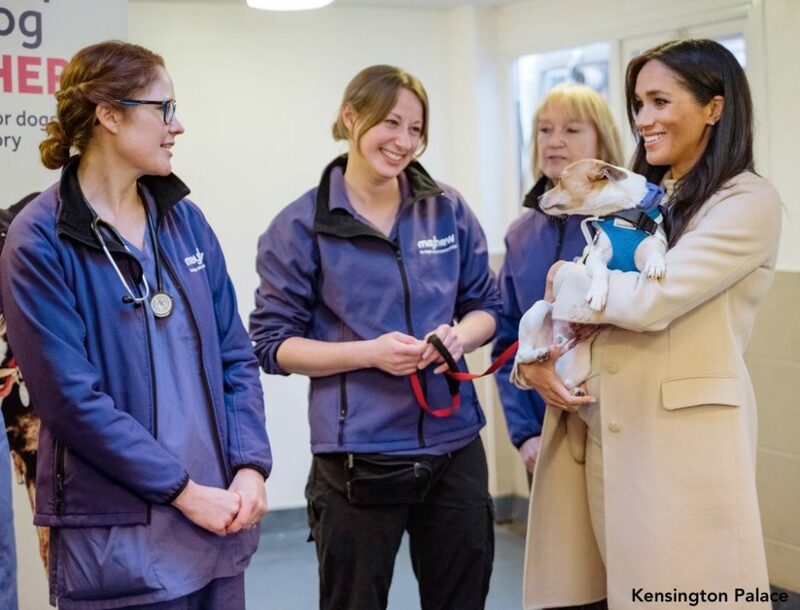 The Duchess also met Head Vet Nurse, Gillian Rich RVN, who spoke with Meghan about the on-site work done at the Mayhew Community Vet Clinic. Mayhew does extensive outreach work with London’s homeless population, working to keep animals and owners together. A dog is often a homeless person’s only companion, but the added expense of vet and food bills puts an extra burden on people who are already in a vulnerable situation. Our Animal Welfare Officers regularly visit the homeless and their dogs at centres and on the streets, where they build close and trusted relationships with them and provide free general health checks and microchipping. Today Meghan met a longtime user of Mayhew’s services in this area, Wully Struthers. Those who have followed Meghan know she is an advocate of “Adopt, Don’t Shop,” promoting animal rescue adoptions. 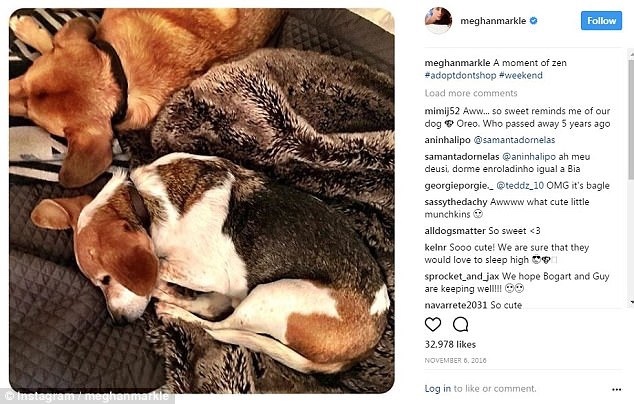 Below, one of Meghan’s Instagram posts showing two of her rescue dogs, Guy and Bogart. When she was leaving this afternoon she spoke about the topic. Now for our look at what Meghan wore, starting with her Armani coat. Many remembered the garment was first worn when the Duke and Duchess visited Sussex last October. Called the Cashmere Double Cloth Coat, the piece features a lapel collar, back vent, button cuffs and three pockets. The Duchess was in a maternity dress from H&M’s MAMA collection, a relatively new line for the retailer. Meghan wore the Fine Knit Dress ($34.99) in light beige melange. 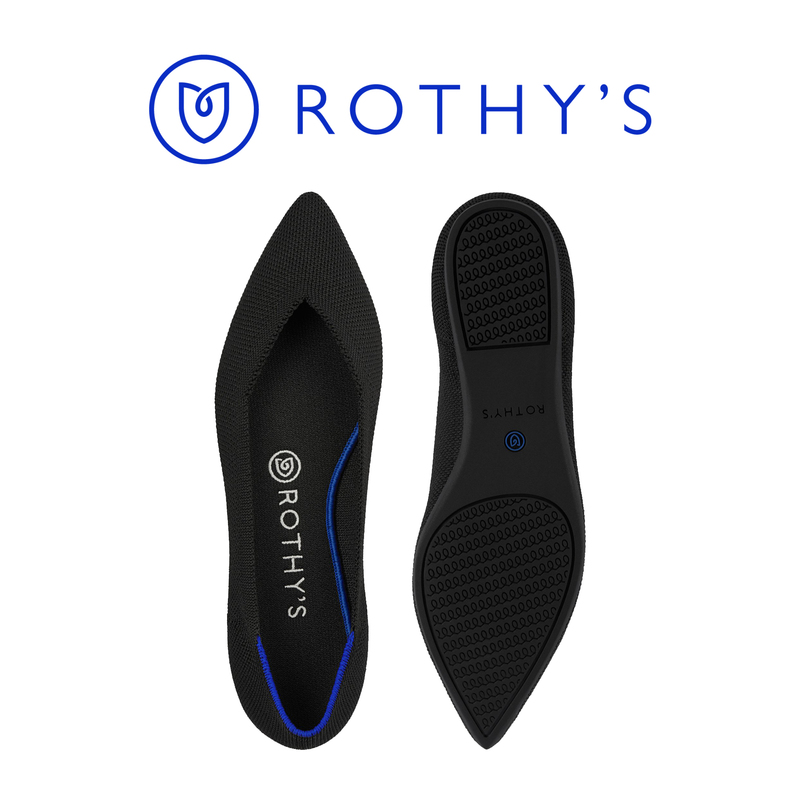 It is made of a viscose/poly blend with a bit of Elastane for stretch and ease of movement. The design is described as having a brushed finish; it also features a stand collar and long sleeves. The dress is offered in dark grey melange as well. The Duchess carried a Stella McCartney bag this afternoon. 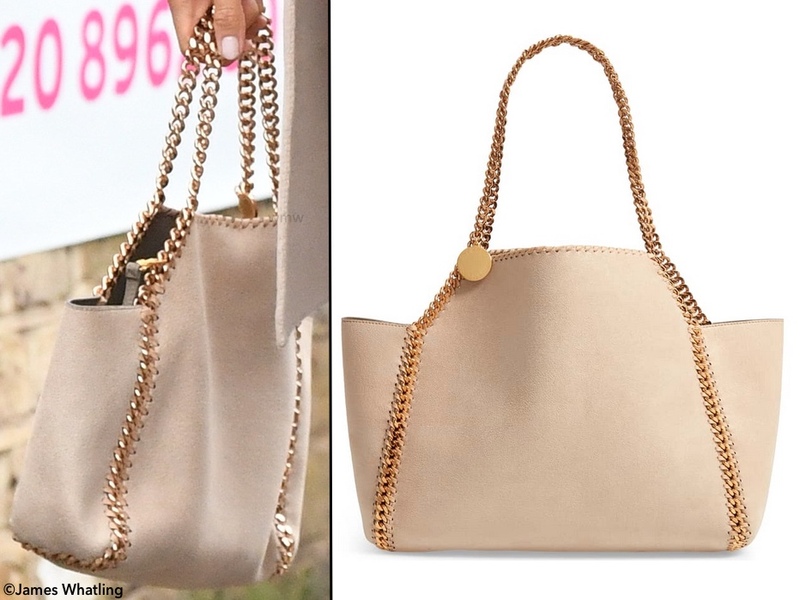 We believe it is the Falabella Shaggy Deer Faux Leather Reversible Tote ($1295) as shown at Nordstrom. 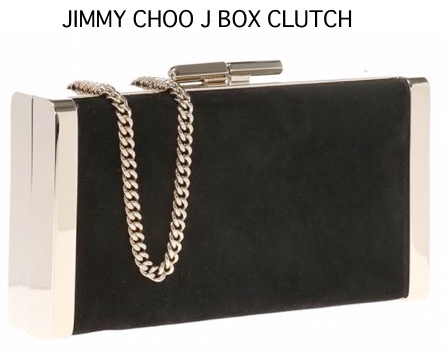 It is distinguished by its shape, the heavy curb chain trim and handle, and the signature whip-stitching look. Meghan’s style is done in a color called ‘clotted cream.’ The Falabella is a basic in Stella McCartney’s collections. We saw Meghan debut a new pair of Paul Andrew shoes, the Coquette style. The company tells us Meghan was wearing the ‘camel’ colorway, part of the brand’s s/s ’19 collection. 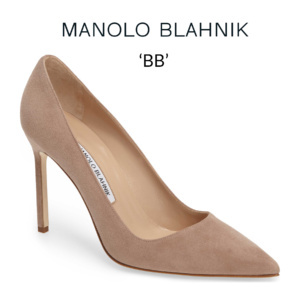 It is a basic slingback with a pointed toe and 3.5′ heel. The Coquette comes in a variety of colors and heel heights. It wouldn’t be a surprise to see the Duchess wearing the design in another color or two. Paul Andrew does not offer ecommerce on his site. Rather, shoppers are directed to Farfetch. While the Coquette is not yet available on the site, there is a broad selection of Paul Andrew styles, including some with great sale prices. Our thanks to UFO No More for their shoe ID! UPDATE 1/16: We are thinking that Meghan is wearing the Pippa Small Herkimer earrings, $1900. 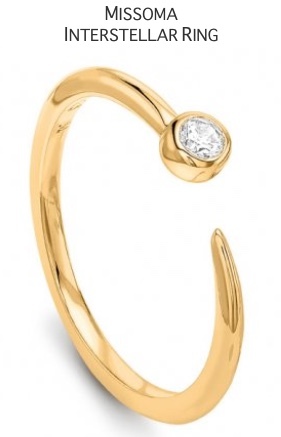 Meghan’s earrings are confirmed to be from Canadian designer Dean Davidson via their Instagram account. They are the Signature Midi Knockout Studs in gold and rainbow moonstone, $145 – available for pre-order. She also appeared to be wearing her Kismet Circle Dangles bracelet. Meghan previously wore the bracelet at the Invictus Games 2017 while watching tennis with Harry. This is an edited, narrated 1:30 piece all about Mayhew. The dress and slingbacks look really comfortable. I really loved this outfit. I think this coat works really well – it still has a lot of the features she likes without swamping her as many of her coats seem to. It’s a paired back version of some of her more drapey (I cannot figure the spelling on that one! ), voluminous coats. I think the monochrome oatmeal/cream look is really classy on her with her skin and hair color. Her belly is adorable! I love the colors of this outfit. It’s a wonderful light neutral and not the dark ot the navy and blacks. I understand the style for maternity wear is belly hugging but this is body hugging. I think this dress is so tight it should not be worn outside Nott Cottage. It looks like one of the seams will split!! She doesn’t have to wear a tent but there has to be something in between. I hate to be so harsh but this outfit does not look like a Royal on duty. On a positive note, her smile is magical and this looks like a wonderful project. This dress looks cheap and creased. Disappointing. I love this!! The coordination of colours works really well, and until today I’d never been able to put into words why wearing a light colour coat over dark clothes didn’t work on her, but I think this outfit proves that coordinating colours like this is a better choice and looks more cohesive. Her previous wearing of dark clothes with a light coloured coat seems too casual, as if one only has one coat which they are forced to wear with all outfits whether it goes or not. Part of being royal is being able to look as if a lot of thought was put into an outfit and have it look professional (not thrown together). I personally can’t understand the justification of a new bag at every engagement, especially if she doesn’t carry it half the time, but I do like this bag as it feels more adult and blends in unlike those VB bags she’s been carrying lately. Other bags have been too ‘showy’ and take too much attention away from the rest of the outfit, they should blend in more and be less of a statement, while also being reusable with another outfit. Love love love this look!! I feel as if she’s been finding her best style lately and it’s been working for her, and her pregnant glow is beautiful. Here’s hoping it continues, as I feel she has a lot to bring in terms of different (and yet still suitable) fashion in the Royal Family. It’s -20 Celsius here in Eastern Canada, and I am still out in bare legs occasionally. I just don’t get cold easily, and you can imagine what I was wearing while pregnant in winter –thin summer dresses with a winter coat. I always feel judged when people tell me they feel cold looking at me. It has never occured to me to tell them that I feel sweaty looking at them! I love this look. I know some will complain about Meghan being back in neutrals, but this all-over monochromatic look is so chic and those cream colors look so great against her skin tone. I am a little sad about the clip with the “fat lady” comment being included here. I am grateful that she was so gracious, but it’s the kind of comment that could be so very hurtful to a lot of women and young girls and I’m sure there are a lot of people who view this site (myself included) who have been wounded by comments like that in the past. It’s painful to find clips like that so casually displayed here. Regarding the “fat lady” remarks please see below a conversation started by “Melanie” on 1.16.19 at 3:40 pm. What qualifies something as a newer brand? I wore a handful of H&M Mama pieces when pregnant with my first 6 years ago. They’re not as long-lasting as some other maternity brands, but they were affordable, comfortable, and flattering. Many were nice enough to wear to work in an office setting. Maybe the line went away and then came back? I think H&M has done that with some things before. I’ve been a longtime follower of WKW and tend to prefer her styles, but I love these monochromatic looks on the Duchess, and am impressed with how she stays true to her own style while, in my opinion, achieving a look that appropriately represents the royal family. I love everything about this look. While I loved the purple and red surprise, it was a lot of fabric. This seems to be better proportioned for her figure. She has great legs and so often she wears midi length dresses, so it’s nice to see a just above the knee dress. When I saw the dress and read it was a bargain item my thoughts were, if a claw or leash sags it it won’t be the end of the world. In the normal world yes dirty paws and a cream outfit would be a nightmare, but I doubt any dirty paws got near her. She picked up a dog indoors, not one that was out on the wet sidewalk. I figured the cream was chosen to hide the dog hair better than a navy or black outfit would. Short version, the dress was appropriate for hiding hairs and if it got destroyed it wasn’t an investment piece. This outfit reminded me of Kim Kardashian. Everyone hates on Kim Kardashian, but I actually think she has a sophisticated way with neutrals that flatter her complexion and also preferred body-con outfits during her pregnancy as Meghan does. 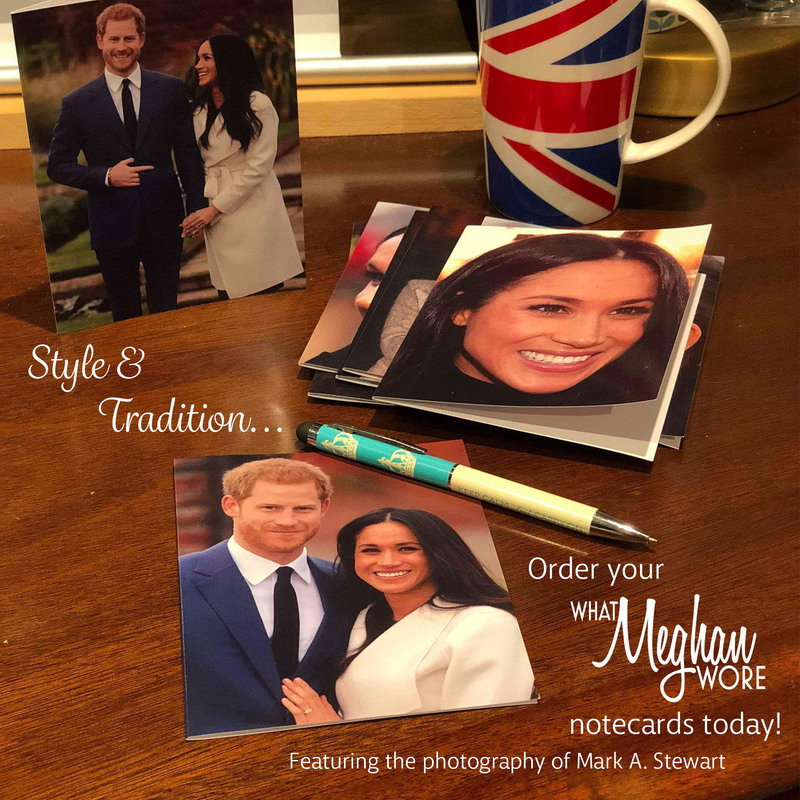 Nice to see Meghan mixing high and low-end. This does look like a Kim ensemble…and often Kim is very chic when she’s doing looks like this! I love all the creams together against Meghan’s skin tone. The monochrome looks very elegant and flatters her complexion. The bag and heels are beautiful and very California. Being from a warmer climate it never occurred to me not to wear closed-toe sling backs year round, I assume that’s what she’s used to as well. I love the colors, and her coat and hair, but oh my goodness, legs! The dress is just too short and too tight to wear with bare legs and strappy heels in January. She makes me cold just looking at her! Lots of pregnant women say they feel hotter while carrying. Maybe she didn’t want to overheat. I love it and she looks more comfortable in this one than in the bright colored outfit. For me the Duchess has been knocking it out of the park in the past 36 hours. (The dress for tonight’s evening event is beautiful on her.) I absolutely loved the red and purple color combination yesterday and today’s monochromatic look is stunning. I’m in love with the handbag and shoes!! 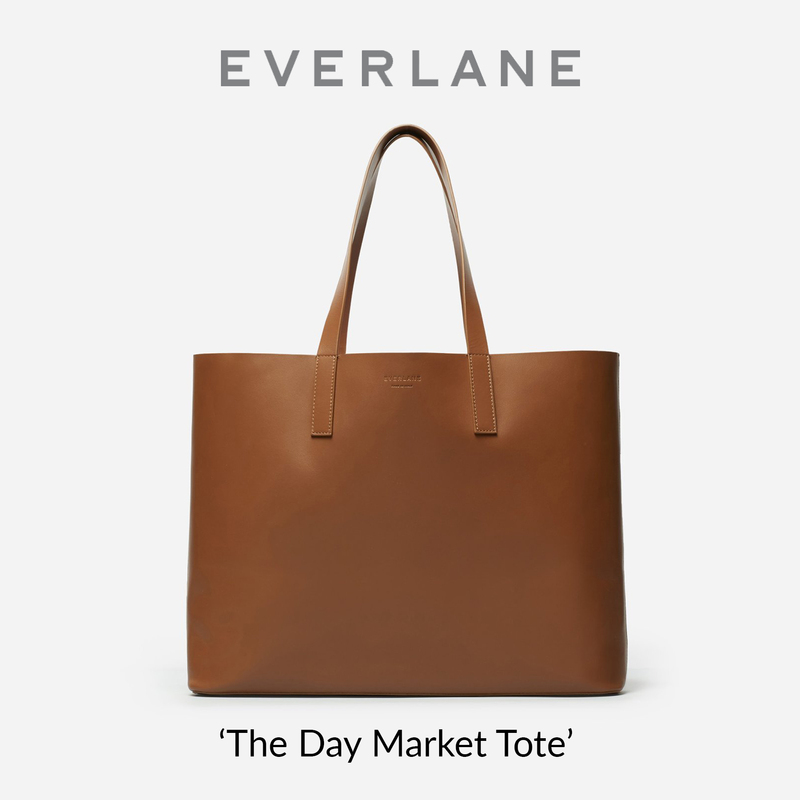 I need to find a cheaper version of that bag ASAP. I’m glad she is mixing high and low. She wears a lot of designer stuff so it’s nice to see her in an affordable brand like H&M. 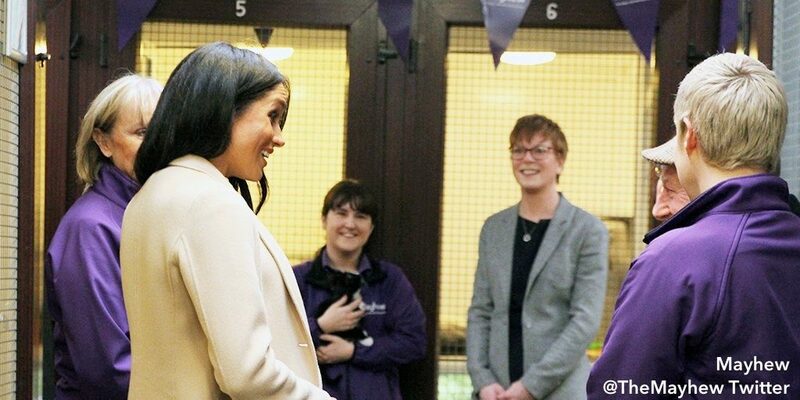 It would’ve been great if Meghan had worn the purple dress from a couple of days ago to Mayhew because purple seems to be their color. Diana did that so well….incorporating the color of the school, charity, etc. into her outfits. When Diana visited Northwestern University in Chicago, she wore purple — the school color — and the city went wild for it. I looooove this look. As a fellow pregnant gal due in May, I love seeing her in maternity wear. H&M does maternity really well, especially for a fast fashion brand. The coat is beautiful, the bag is going on my “someday” wish list. But I do wish she had saved this for a different occasion, it doesn’t seem appropriate for an animal shelter nor for the middle of winter. A beautiful take on winter whites…winter creams! So pretty and appealing and Meghan has given me a great idea for a fresh winter palette for an event I have on my calendar this coming weekend. 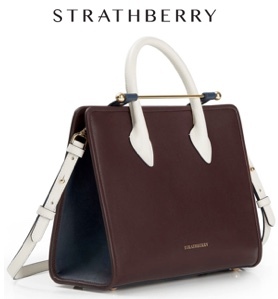 Count me in the Stella McCartney tote fan club, love the chain whip-stitching look. Mayhew’s diverse programs which include outreach to elderly care facilities, an on site vet clinic and visits to the homeless is exceptional! 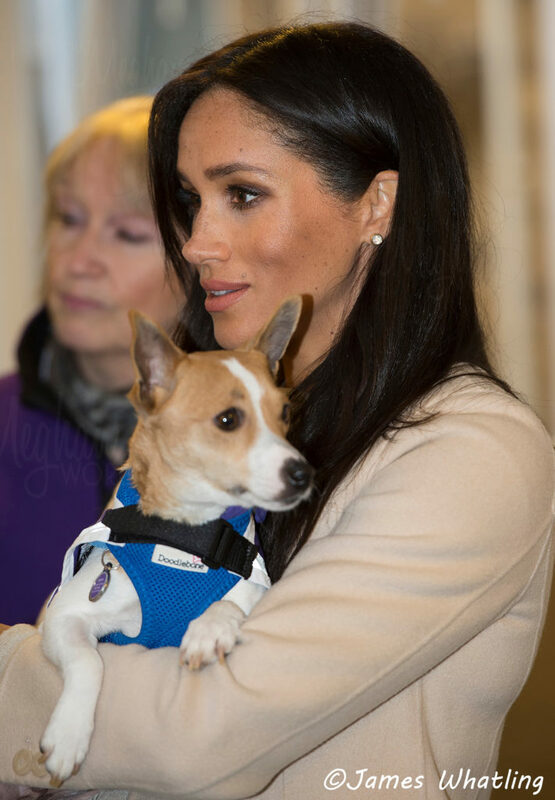 Happy to know Meghan is on board to bring even more awareness to this amazing animal welfare charity. Well after the blast of red and purple, Meghan is back to neutrals. I do prefer the cream colour to the sombre black and navy and I like the monochromatic look. Kudos to her for keeping costs down with an H&M dress. 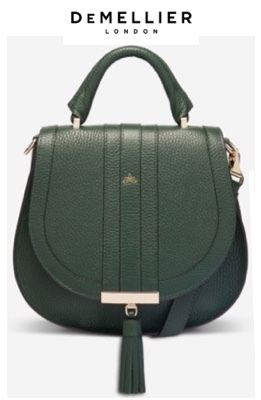 I do wonder, however, to see it in person, if it looks cheap worn alongside the Arnani coat and Stella McCartney purse. While the dress is maternity wear, it looks very tight. 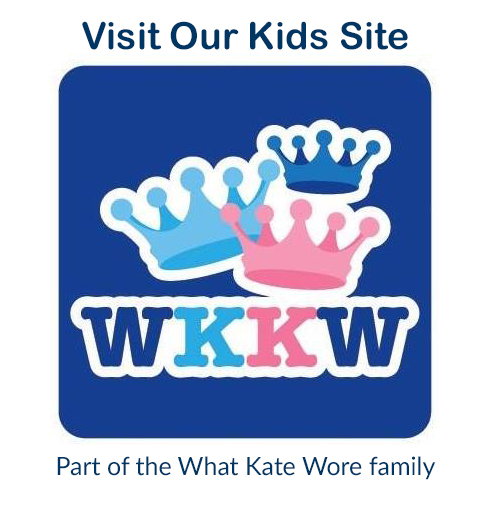 Although there is nothing offensive about a pregnant body, most Royals when pregnant, select clothing that doesn’t cling. But just as Meghan has bare legs and sling back shoes in winter, she does things her way. My family is Jamaican (mom’s side)…”you’re a fat lady” is like, older-Caribbean-lady code for “you look like you’re having a healthy pregnancy.” Like, my grandmother said I was getting fat when I hit puberty. She meant I was developing appropriately (which I found out after crying to my mom about it). So it was funny to hear, and I’m glad Meghan took it in stride. I love her accessories so much and she’s just so gosh darn beautiful. Thank you for your comment! I worked in an art museum for many years and had the opportunity to research and be surrounded by art from many cultures. What you explained your grandmother had to say about being fat – appropriate and beautiful – is something many cultures value and portray in their art. One example at our museum was the South African beaded dolls from the Ndebele people. Visitors were puzzled by the doll’s “rolls” from neck to feet, symbols of fat rolls which portrayed health. Not everyone’s beliefs and cultures are the same and I appreciate you sharing your grandmother’s story. Love this monochrome look that looks both comfy and classy. I’m only puzzled by the slingbacks as a choice of shoe. The color works well, but I always associate the style with summer, so it seems strange to see with a coat. My gosh, she really has a gift for accessories. I can never get over her simple but unique jewelry choices, and that bag is a.maz.ing. I really like the monochrome effect that she’s got going on here; and these taupey tones look so great with her coloring. But I do think the dress looks a little short and clingy (or maybe it’s creeping up), and that makes it look like it’s just not the same standard as the bag and the gorgeous coat. I’m not a brand snob; I don’t care that it’s from H&M. It’s just that the material looks sort of thin and cheap and that makes it not lay well. Wearing her hair down was a nice choice with this look; the contrast of her flowing dark hair against the coat is really elegant. I really like the pale creams on Meghan and used in monochrome they look quite glamorous. Unfortunately I’m not 100% sure that quite fits in with an animal rescue centre, particularly when in close contact with assorted pairs of paws. I love the Armani coat which being shorter is perhaps a nod towards a casual vibe compared with the heavier trench styles Meghan sometimes favours. This single-breasted style seems more in keeping with a royal image than having tie belts worn loose and flapping. The dress is a truly inspired find, such a handy high-street maternity item that I could see being helpfully versatile. The Coquette slingbacks are lovely though perhaps a touch summery alongside the cream tones, and I’m smitten by the gorgeous McCartney bag – such an imaginative take on the gold chain feature. Happy to see the Duchess in properly fitting maternity wear. 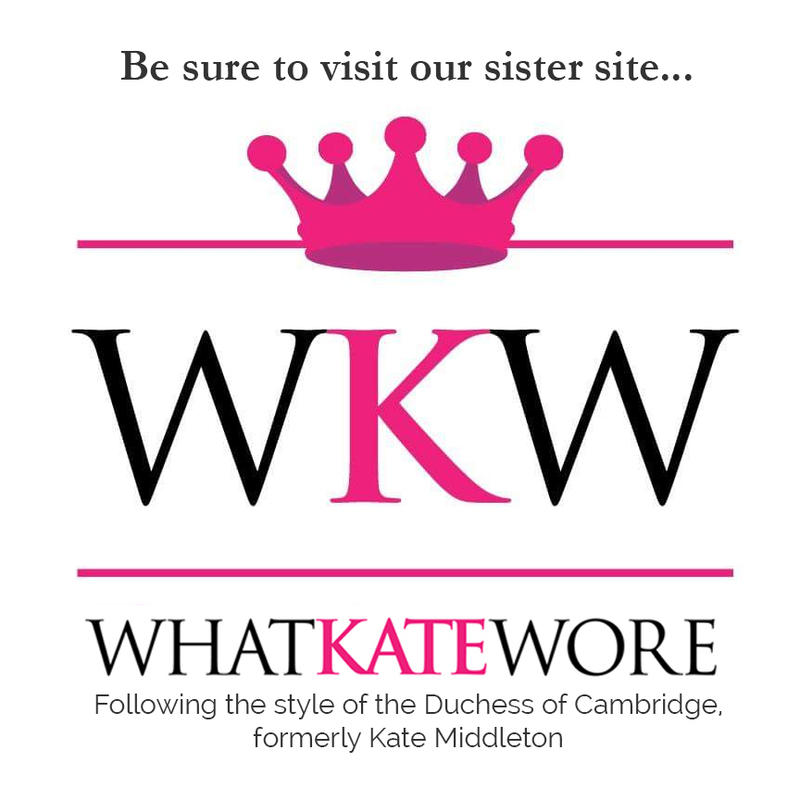 However I can’t get behind the bare legs and particularly the slingbacks on a cold day in the dead of winter when representing the royal family. The dress still would,have looked great with tights and booties. I have an enormous penchant for neutrals, particularly camels and beiges. And this outfit of Meghan’s ticks several of my preferences, not just the subtleness of the palette, but the monochromatic mix of neutrals and her lovely styling (piecey blow out, minimal accessories, gorgeous suede bag). I like it all, well with exception of the gold chains on the bag–though I do love it’s color. And I really love her hair today. I would wear every piece of this ensemble. She looks appropriate and elegant.